Could More Blacks in Banking Have Prevented the Meltdown? Last month Politico reported on a "little-noticed" section of the Wall Street reform bill. It gives the feds power to kill contracts with firms that fail to initiate workplace diversity. The law requires "fair inclusion" of women and minorities and "goes further than previous attempts by regulators to promote diversity in the financial sector." 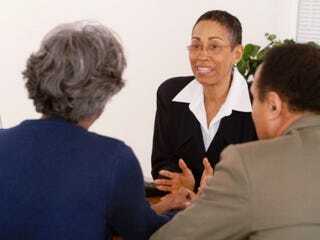 The Bureau of Labor Statistics reported a small black presence in a variety of financial occupations in 2009. Eighteen thousand, or 5.6 percent, of the nation's securities, commodities and financial-services sales agents were black. About 5 percent of the country's 94,000 financial analysts were black. That same year, women of all colors held 16 percent of executive and board positions in the financial sector. The lack of diversity means that white men with similar opinions usually make decisions that affect the whole world — the majority of which doesn't look, or think, like them. Forcing firms to diversify, some suggest, will provide substantial benefit. Imagine the disasters that might have been mitigated if black females instead of white males had managed the toxic mortgages that harmed so many. But would a black manager's decisions actually have been different? Some observers wonder about the value of greater diversity in finance. Santa Clara University professor Hersh Shefrin is an economist who has been a pioneer in behavioral finance, which looks at psychological factors that underpin financial decisions. Shefrin says that he gets the principle behind industry diversity: "There may be a benefit to having a loan officer who has personal experience with the people they're lending to." But he adds, "Having said that … I can't see [the diversity provision] making much of a dent in improving the sorts of problems that led to the global financial crisis. We have to remember that the culture of banking has more to do with the structure of firms than with the personal tendencies of employees." Shefrin thinks that the financial sector's corporate culture prevents a diversity of opinion, even if it exists. He cites specific instances, prior to the mortgage crisis, in which female underwriters warned their supervisors about giving loans to underqualified applicants. "Do you know what they were told by their superiors?" he asks. "They were told, 'You approve the loan — and if you don't, I will.' Then they were told that they'd been put under review for firing. There is great pressure applied to these people." Some researchers think that if the demand to make as much money as possible didn't rule, women and minorities might make better financiers — or less greedy ones. In a 1998 Economic Journal study (pdf), women were shown to be almost twice as generous with money as men. UC Berkeley researchers also say in a recent study that the poor were much more inclined to give to charity than the rich were. Looking at these results, some analysts project that blacks would make more deals with those in need than their white counterparts would. That may be a problem, says Dan Ariely, who studies and teaches behavioral economics at Duke University. He thinks that the generosity of minorities might have resulted in an even greater financial crisis than the one we've been facing. "People like people like them," he says. "Many studies show that we tend to favor our in-group, we tend to view their actions as more virtuous, and we tend to suspect them less. It's a very powerful pull." Ariely posits that if more minorities had been in finance prior to the mortgage crisis, predatory lending would have increased. "If you're willing to believe — as I do — that the people who gave these loans did so not with malicious intent, it follows that they could have then convinced themselves even more to give to someone of their race, gender or ethnicity. In other words, I believe that if you were willing to give a predatory loan to a person with a certain risk profile, you'd be willing to give even more if that person had a slightly worse risk profile but [was] also from your race and gender." Eric McKissack is the CEO of Channing Capital Management in Chicago. The African-American veteran of decades in finance sees both sides of the diversity debate. McKissack agrees with Shefrin that financial culture compels obedience. But he disagrees with Ariely's statement that minorities in finance would be swayed by minority clients. "People who are hired and experienced [in finance] are going to absorb many of the values of their peers, who may be from the majority population," McKissack says. "But my take is that an African American who's worked so hard to be in a decision-making role would not allow racial allegiances to control his decisions. Sometimes they may feel the need to be more doctrinaire because they do not want to be seen as playing favorites." How Big a Difference Can Blacks Make? That depends on who they are. If someone works for a majority-owned firm, unless he or she is in a secure executive position and can question without blowback, that person doesn't — or leaves. The black male or female CEO of a majority-white-owned public or private financial company has a fiduciary responsibility to shareholders and investors. Making money isn't the only task; preventing the company's collapse is equally important. Deborah C. Wright, the CEO of Carver Federal Savings Bank, puts the diversity issue in perspective. "Making money is not wrong or immoral," she says. "No one that goes to work for a financial-services firm should go for any other reason. These firms can and do make a huge difference beyond financial profit. But that's an 'extra,' not the purpose of their existence. I don't have a problem with that." Cord Jefferson is The Root's Washington reporter. Follow him on Twitter.